Tommy Lacy: God said people make mistakes. Al Percolo: God never said people make mistakes; where did you hear that sh**? He said honor thy mother, and thy father, and thy Yankee contract! As my girlfriend can attest, I tend to live and breathe baseball. There is no other sport that I follow as closely, and as Bob clearly knows, I bleed St. Louis Cardinal red. While my love for baseball grows cold each fall due to the end of a season, there have always been films about the sport to keep my interest until spring training rolls around. From Major League to Field of Dreams and most recently For Love Of The Game it is hard for me to dislike any picture even remotely related to baseball. On the other hand there are films about the sport that make me yearn for the real deal. Michael Ritchie's The Scout is such a film. Following a top pitching prospect for the Yankees from his beginnings in the Mexico leagues to his start in the first game of the World Series, The Scout is a bit of a jumbled mess. This is a picture that attempts to blend emotion and feelings with baseball, which has done well before, but The Scout feels uneven and forced. Yankees scout Al Percolo (Brooks) is in a bit of a slump. His latest prospect throws up on the pitching mound when he should be throwing from it, and other recruits are an assortment of head cases. After his latest fiasco Percolo is banished to Mexico to scout talent South of the border. While most towns on his itinerary yield little talent his last stop showcases the greatest pitcher to ever play the game. His name is Steve Nebraska (Fraser), a right hander with the gift of speed, as well as the gift of hitting. After little deliberation Steve agrees to don the pinstripes and come to New York. The only problem is that Steve is far beyond goofy, and has issues stemming from an abusive father. 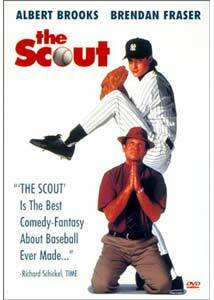 For a movie about baseball, The Scout fails to obtain the amount of detail to make things plausible. From a sophomore in high school being drafted and immediately starting for the Yankees to an American league pitcher batting in the World Series in an American League park, The Scout seems to laugh at the conventional wisdom of the game of baseball. Written by comedy genius Albert Brooks and Andrew Bergman, the weak screenplay simply lacks compelling characters. Key aspects of both Percolo and Nebraska's histories seem to be missing, which results in the viewer never understanding or caring for the characters. A psychiatrist played by Dianne Wiest tells Al that Steve had an abusive past, though nothing more is ever said about it. One might think that if this were the reason why Steve acts out in anger towards anyone who tries to help him more time would be devoted to the situation. I have always stood alone in my defense of Brendan Fraser as one of the best young actors. There is something eerily reminiscent in Fraser's work that reminds me of a 1950's matinee idol, though his choice in projects can be a bit odd. In The Scout Fraser's usual charm is gone, instead displaced with a sort of bewilderment at his situations. Though it may be the fault of the screenplay Fraser's performance is completely one note. Albert Brooks also seems out of place in The Scout, although his performance as a sort of modern Oscar Madison is winning in its own right. Percolo is a man who lives and breathes baseball and his lack of knowledge in any other area of the world is a treat. But Brooks' performance makes Al look like an overbearing jerk, when he should be likeable enough to allow the audience to root for him. Image Transfer Review: Presented in its original 1.85:1 aspect ration The Scout fails to deliver the high level of quality that has become standard on most Fox releases. The largest problem with this anamorphic transfer is the surprisingly bright look in most scenes. Creating a soft image the brightness becomes most distracting in the exterior scenes in New York. Other interior scenes such as the psychiatrist's office look well lit and detail and sharpness are spot on. Aside from that single flaw the transfer looks good with little edge enhancement and only a handful of print flaws. Audio Transfer Review: Presented in a Dolby Digital 4.0 mix The Scout falls victim to the comedy soundtrack curse. While the use of the split surrounds is not needed the rear speakers are often quiet with only the film's score coming across. Dialogue sounds fine with only a few moments where it could be better. An English 2-channel Dolby mix is also provided. Extras Review: A short featurette on the making of The Scout, as well as a 5-minute clip featuring Cardinal players that took part in the climactic World Series scenes are essentially the most noteworthy extras on this new DVD. 8 TV spots as well as the theatrical trailer for The Scout and Bedazzled, Monkeybone, and Airheads round out the extra features. As I write this review my beloved St. Louis Cardinals are preparing for a run through the post season. My love for baseball is at an all time high, and yet I just couldn't get into The Scout. While the DVD contains a fine presentation from a technical standpoint the same can't be said for the film itself.